"With age, comes wisdom and you can use your acquired wisdom to help fight memory problems in new and creative ways." Whether you're occasionally forgetting a name or you just can't seem to stop forgetting your keys, you can do something about it. 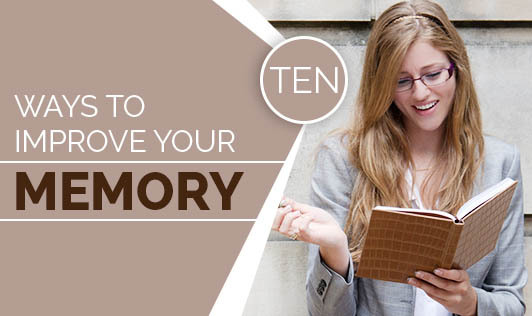 With the right lifestyle choices and basic knowledge of memory enhancing strategies, you can boost your memory! • Solve puzzles or riddles to get your brain cells working. This exercise helps your mind because you involve a number of mental tasks such as logical reasoning, mathematics, pattern recognition and nonlinear thinking. • Clench your fist, because research suggests that balling up your right hand and squeezing it tightly makes it easier to memorise phone numbers and shopping lists. • Quit multitasking, because studies show that it takes eight seconds to fully commit a piece of information to memory so concentrating on the task at hand is vital. • Use mnemonic devices to remember information, often used by student to aid recall. A mnemonic is a way to remember information. For instance, one might associate a term he or she needs to remember with a common item that one is very familiar with. The best mnemonics are those that use positive imagery, humour or novelty. One can even come up with a rhyme, song or joke to help remember a specific segment of information. • Address your stress because when you're stressed, the stress hormone cortisol may interfere with the brain's control centre for learning and memory, thus further interfering with encoding information or retrieving it. • Get adequate amount of sleep because losing just three or four hours of sleep on one night can erode memory. During deep sleep, it is believed that the brain shifts memories from temporary to longer term storage. • Exercise regularly, as researchers believe that exercise boosts the brain chemical called norepinephrine which has a strong influence on memory. • Nutritionists suggest that in order to maximize memory, one should maintain a balanced diet that includes healthy fats, plenty of fruits and vegetables as well as whole grains. If your memory loss affects your ability to complete daily activities, contact your doctor immediately for a proper evaluation of your symptoms!